Julia Shenkman is sworn in as chief of staff at Wednesday’s Senate. The Weinberg junior introduced election commission guidelines reform during the meeting. New Associated Student Government chief of staff Julia Shenkman and parliamentarian Henry Molnar introduced election commission guidelines reform at Senate on Wednesday. Shenkman, a Weinberg junior who served as this year’s election co-commissioner, said the most important proposed change is categorizing campaign infractions as “violations” and more serious “strikes.” Only by incurring three strikes can a campaign be removed from the ballot, whereas under the prior guidelines three violations, regardless of severity, could result in removal from the ballot, Shenkman said. The new system would distinguish between minor and major infractions. During ASG President Sky Patterson’s campaign in April, she received two violations under the current system: first for recruiting a campaign manager before the election commission had been elected, and then for sending out a pre-campaign email that included promotional material. Molnar, a Weinberg sophomore, told The Daily the proposed changes are a result of extensive meetings with Patterson and executive vice president Emily Ash, as well as their campaign opponents, SESP junior Justine Kim and SESP sophomore Austin Gardner. Shenkman said this change was proposed because technical violations don’t have electoral repercussions. “We had cases with both campaigns where we had technical violations, but in all honesty, in the spirit of the guidelines, they had no impact on the election,” she said. Molnar said the change would mean the election commission would only operate in its area of expertise. 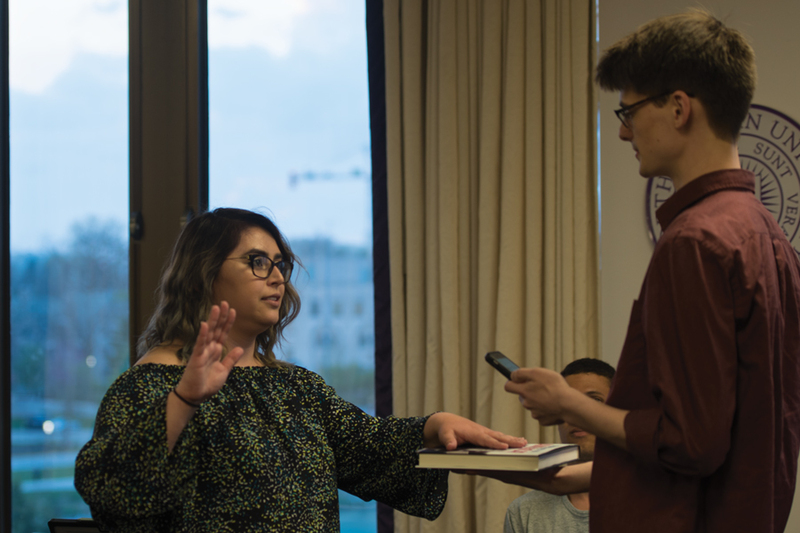 Senator Alex Smith said that particular proposal made him “uncomfortable.” The Weinberg sophomore said a potential violation’s impact or lack of impact on the election is not easily defined. Other proposed changes prohibit harassment of election commission members and voters. In addition, the new code change would prohibit the chief of staff and the speaker of the senate from endorsing a candidate during their tenure. Senate also unanimously approved the budget for the 2018-19 academic year. The new budget increased the “special projects and events” line item budget by $5000, which was made possible by scrapping the previous $5000 allocation to the “conference fund.” Benson said the cost of conferences has dramatically increased, and Patterson and Ash would rather finance ASG’s special projects. Later, Benson announced McCormick sophomore Sid Ahuja was elected as the new vice president for student activities. Medill freshman Cameron Peters was elected to the Rules Committee.